Vanilla Cake – light, tender, and moist vanilla cake covered and layered with a vanilla frosting. Above all, this easy-to-bake cake is the most versatile cake you’ll ever bake. You can doll it up depending on the occasion! Let me share this with you guys to welcome this vibrant new season. Since spring is finally official, it deserves the most light and buttery cake that can be served on any occasion. Yes, I’m talking about Easter, Mother’s Day, birthday, anniversary – this cake will take you further! 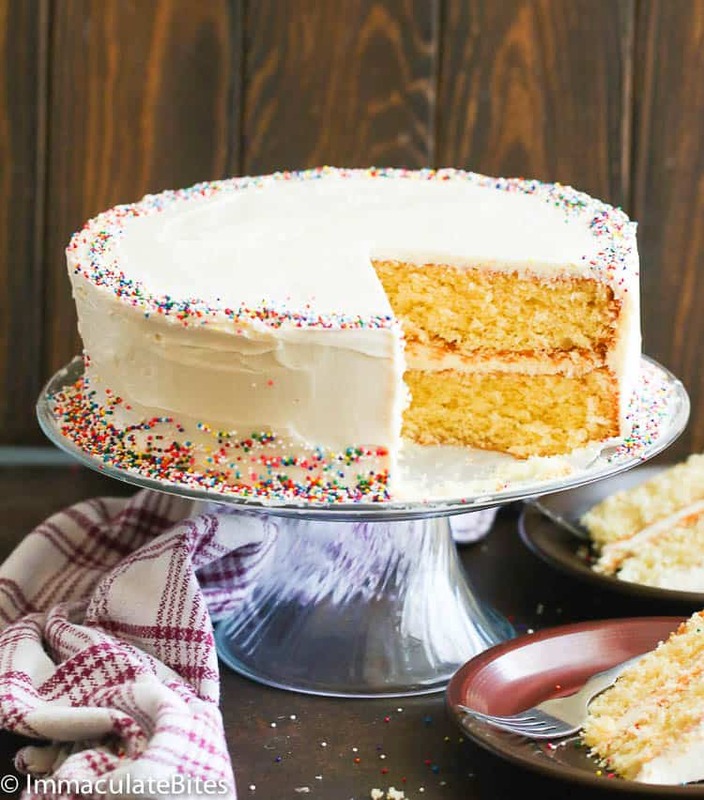 Is There a Difference Between Yellow Cake and Vanilla Cake? White cakes are often used in weddings because of its, you guess it, pure white color. This type of cake uses egg whites only and shortening to keep it’s white color. On the other hand, yellow cakes use both the egg white and yolk and uses butter instead of shortening to give off that yellow tint. Using the whole egg and butter means yellow cakes have more fat compared to the white ones; the reason why it’s more tender and flavorful. Now here comes the Vanilla Cake to add more confusion. 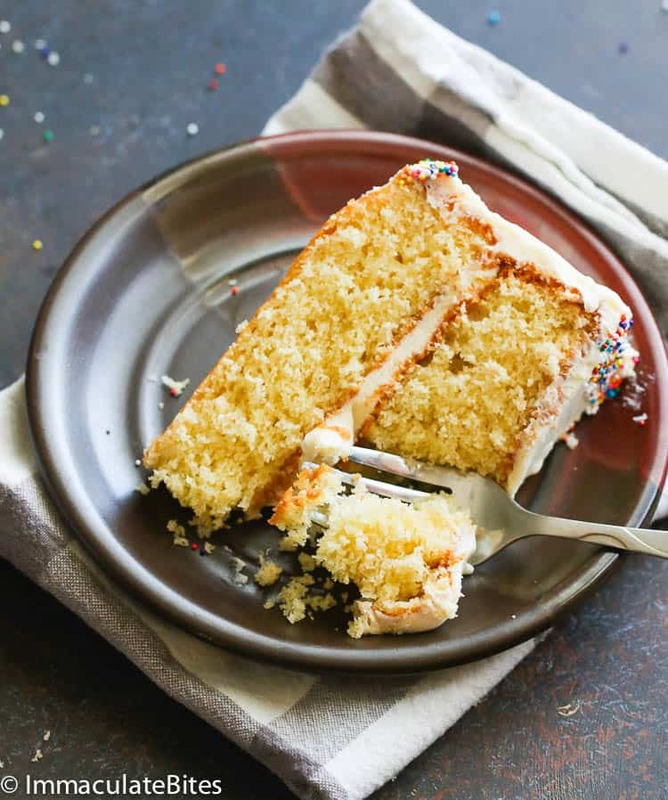 Bot yellow and white cake add vanilla in its batter as a flavoring so which means that we can call them yellow vanilla or white vanilla cake. It’s also worth noting though that some white cakes stray away from using vanilla to keep its pure white color. So if you see a recipe that specifically says Vanilla Cake, you got to check its ingredients if its white which uses egg whites only OR yellow cake which uses both the yolk and egg white. As for our Vanilla Cake, I use whole eggs in this recipe and butter. But what makes it even more on the “vanilla-er” side is the smooth vanilla frosting which I think you will love. What Makes A Cake Moist? If you’ve noticed (and kudos to you), I use butter and oil in this recipe as oil adds moisture in a cake. Aside from that, adding oil in this recipe also results to a lighter crumb which tends to age better as the days go by than pure butter cake. Moreover, using sour cream on cakes (also try my Moist Banana Cake HERE) makes it more moist as it contains acid which reduces gluten formation which tenderizes the cake or baked goods. 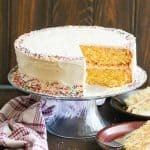 Can I Use Both Butter and Oil in Cake? Oh yes, you sure can. This recipe has the combination of butter and oil to give off that nice buttery taste while keeping it soft and moist at the same time. Cake using pure butter tends to be more dense and dry compared to adding oil into the batter. I use canola oil for this Vanilla Cake, but you may substitute it with vegetable oil. Can I use a Different Pan Size? Yes, you are most certainly welcome to try but make sure to adjust the baking time. 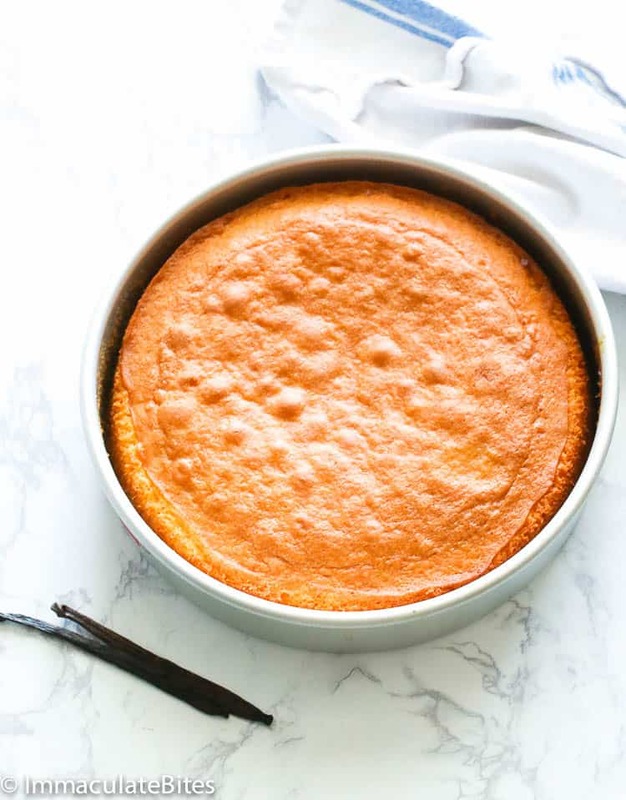 I haven’t tried making this recipe on a different pan size as it is specifically written for 9-inch round pans that makes two layers of Vanilla Cake goodness. For those adventurous enough, feel free to use your favorite frosting and doll it up however you like. You may use a chocolate frosting instead (or check my Guinness Chocolate Cake HERE) or sprinkle this cake with toasted coconut flakes.Your call! 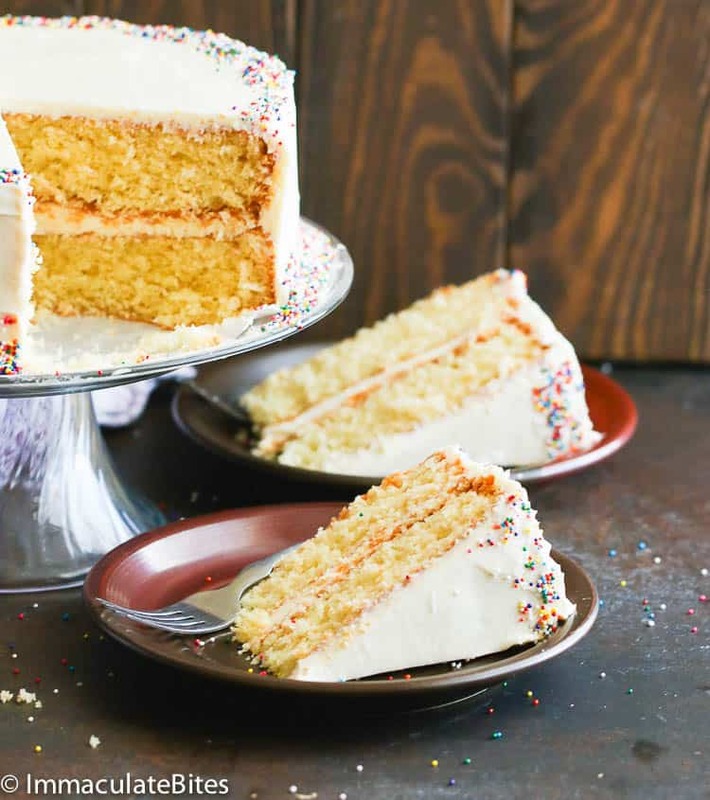 That’s probably the best thing about this Vanilla Cake recipe; you can pretty much customize it to go with the occasion. The most basic cake to have on your list. Make every day worth celebrating! Do not skip the oil and replace with butter. A combination of both makes a far better cake. Oil makes this cake more moist, lighter and it improves its shelf life. If you don’t have sour cream, you can replace it with the same amount of greek yogurt or buttermilk. See other substitution options HERE. I haven’t tried this recipe without any eggs, but you can check out this ways on substituting eggs on recipes. Make sure your ingredients are all in room temperature to avoid over mixing and over baking. To do this, set out all the ingredients an hour before you begin. Cool the cake layers completely before you start assembling them. Even semi-warm cake layers causes the frosting to melt completely. Refrigerate the cake after frosting for at least an hour to let the frosting set and the crumbs tight. Vanilla Cake - light, tender, and moist vanilla cake covered and layered with a vanilla frosting. Above all, this easy-to-bake cake is the most versatile cake you'll ever bake. You can doll it up depending on the occasion! Preheat the oven at 350 degree F. Then grease 2 “9” inch pan generously with baking spray and set aside. Using a hand mixer, cream together the butter, vegetable oil and sugar for about 3 minutes, then add sour cream continue mixing until it is fluffy and starts to look white – about 2 minutes or more. Add in the eggs one at a time beating well between each addition. Add in the flour, baking powder and salt and mix until combined. Then add the milk, vanilla extract. Continue mixing making sure to scrape the sides and bottom of the bowl so everything gets mixed in. Pour batter into the 2 greased cake pans in 2 equal parts. Bake at 350 degree F for 18 -20 minutes until a tester inserted in the center of the cakes come out clean. 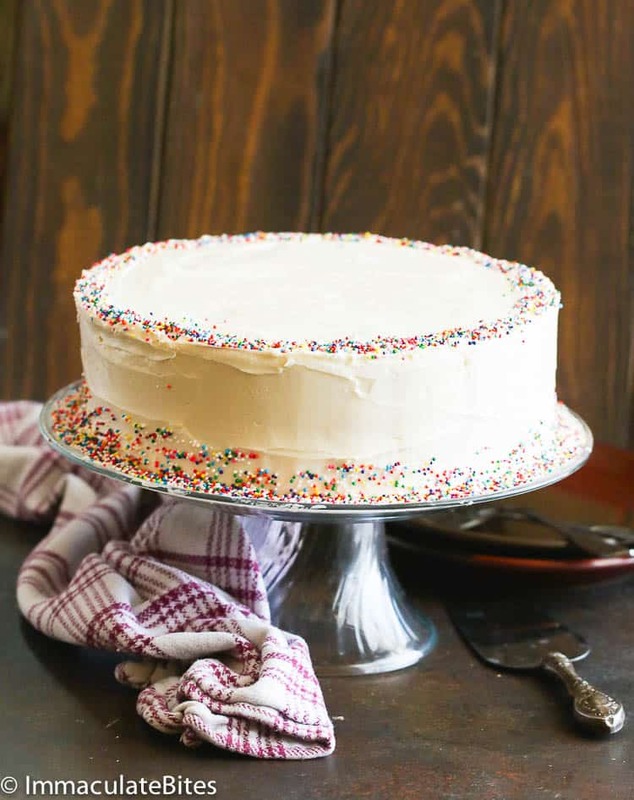 Remove cake from pan and transfer to a wire rack and let it cool completely before frosting with your favorite frosting, in this case I used vanilla frosting. Add butter in a medium bowl then sieve in powdered sugar a little at a time . Mix using wooden spoon or electric mixer. Pour in vanilla extract. Gently add just enough remaining milk to get to make the frosting easy to spread. Adjust thickness of frosting with more powdered sugar , if too thick add more milk . If you don't have sour cream, you can replace it with the same amount of greek yogurt or buttermilk. See other substitution options HERE. I haven't tried this recipe without any eggs, but you can check out this ways on substituting eggs on recipes. Store leftover Vanilla Cake in an airtight container. Preheat the oven at 350 degree. Then grease 2 “9” inch pan generously with baking spray and set aside. Using a hand mixer, cream together the butter, vegetable oil and sugar for about 3 minutes, then add sour cream continue mixing until it is fluffy and starts to look white – about 2 minutes more. Add in the eggs one at a time beating well between each addition. Add in the flour, baking powder and salt and mix until combined. Pour batter into the 2 greased cake pans in 2 equal parts. Bake at 350 degree for 18 -20 minutes until a tester inserted in the center of the cakes come out clean. Add butter in a medium bowl then sieve in powdered sugar a little at a time . Mix using wooden spoon or electric mixer. Pour in vanilla extract. Gently add just enough remaining milk to get to make the frosting easy to spread. Adjust thickness of frosting with more powdered sugar, if too thick add more milk. Proceed with frosting and decorate with sprinkles, if desired. I just made this cake for my mother’s 92nd birthday party. It was a great hit!! I’m sure I wil make it again. Awesome! Thanks for the feedback Sandra.